This past week I handed in a proposal I had been working on. In the writing world, these are my least favorite part of the job. But work is called work for a reason:) And while there are several difficult elements for a writer, the proposal is one of the toughest for me. Now a proposal goes through several sets of eyes. It's critiqued, fixed, and critiqued again. This happens with both the synopsis and the sample chapters. Once it is finally in what would be considered the final stage, then I upload it to a voice app that will read it back to me. This allows me to catch mistakes my eyes miss. After I fix those, I send it to my agent, which I did. By that time, it should be perfect, right? Imagine my surprise when, after I had already hit "send", I opened it to quickly check something, and I saw a very obvious mistake at the beginning of the second paragraph. The second one. And the perfectionist in me cringed! Guys, I'd read those chapters three times. I'd listened to them once. Then I'd read them again--all before I sent them off. Yet there within the first 100 words was a mistake that was far from hidden. How did I not see it? Because I'm not perfect. I think God enjoys reminding me of this often. See, I am a recovering perfectionist and most likely will be for my entire life. 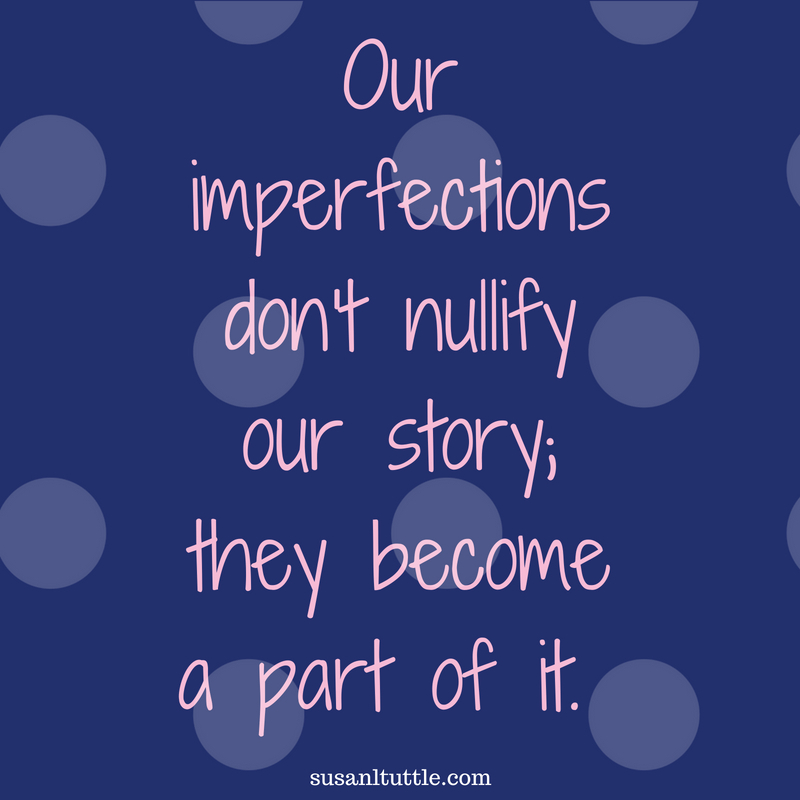 I battle this beast of believing that unless I am perfect, God cannot use me. My initial response in seeing that tiny error was that the rest of my work was useless. The other 11,000 words in the sample chapter, the synopsis that showed the heart of the story, my words about how I hoped this story would benefit readers...all of those things were null and void due to a minuscule typo. Ugh. The lies that satan wants us to believe. Being imperfect isn't anything I'll ever fall in love with, but it's also something I"ll never escape this side of heaven. Neither will you. 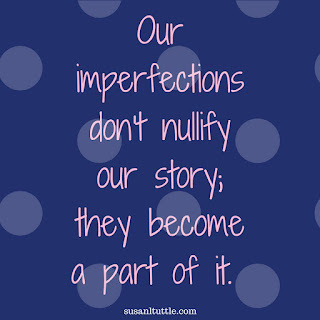 So let's begin to reframe how we see our imperfections...they're simply one facet of an incredible story God is telling through us that ultimately shouts out his grace and mercy. Because at the end of the day, the only that story that matters, is his.